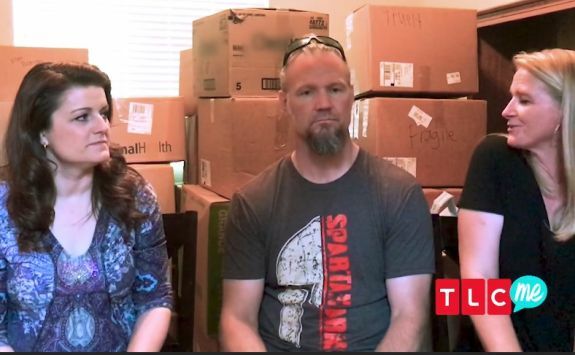 Sister Wives star Kody Brown has packed up his four wives and cornucopia of kids and high-tailed it to Flagstaff, Arizona, and it appears that the Sister Wives star is already starting to build a new Brown Family Cul-de-Sac in the Grand Canyon State! Kody, who announced back in July that he and his super-sized family were packing up and leaving Las Vegas, recently spent $820,000 on property for his family’s new Arizona homes. According to the Browns’ Twitter postings, the family made the move in early August. Kody’s third wife Christine appears to have made out the best in the deal. Her parcel reportedly measures 5.16 acres and cost the Browns $300,000. For some reason, Christine’s plot is considerably larger and more expensive than the parcels belonging to Kody’s other three wives, Janelle, Meri and Robyn. In July, Kody explained why he and his family are moving to Arizona. Kody has a total of 18 children with his four wives, but currently, only about 10 are still living at home. In a sneak peek for the new season of ‘Sister Wives,’ Christine boasted of their new town, “It’s green, there’s four seasons. It’s a little bit smaller, quite a bit smaller than Las Vegas. Because when you're going through a move, you do it in style, #LuLaStyle y'all! And of course it had to be the #LuLaRoeMichael with the dice, add a little #VegasStyle to the mix! 🙂 #LivingMyWhy #BecauseICan #LoveWhatIDo #LuLaRoeRetailer #LuLaRoeForLife #ICantBelieveIGotHimInLuLa ?????? Season 12 of ‘Sister Wives’ will air later this year. Watch Kody, Christine and Robyn discuss their move to Arizona in the video clip below! This family is so disgusting. Sharing a man, ewwww. Cody is a condescending, arrogant little prick who needs a hairstyle. They aren’t sister wives. One is actually married to him and the rest are nothing more than concubines. But yet they have $820,000 to spare for housing in flagstaff??? Isn’t it ironic that 5 years ago Grody was the one who chose Las Vegas and called it his ‘safe haven’ and ‘sanctuary’ but now he acts like he has to run and move again? But why – of all the places in the world – did they choose Flagstaff? Please don’t get me wrong, Flagstaff is a nice city but he could have picked something more closer to Meri’s BnB or some place more posh/glam or simply a state where there are no issues with polygamy. Of course Robyn needs to be listed on Christine’s super-sized parcel too because Christine is the only ‘stay-at-home’ full time mom with no own income. Robyn is not only Grody’s legal wife but she seems to be the mastermind behind that infamous jewelry collection which could be loaned on. I’m confused. I thought Meri had a new man, and she wasn’t moving to Arizona. Another season of talking about being catfished. UGH! I don’t watch much anyway. The Ashley’s recaps are SO MUCH better! Oh please. Kody will wear or do anything if it’s for a picture, a post, or any attention whatsoever! How the f can they afford that? Meri is going to have a 4.46 acre wet bar and the remaining will go to the rest of the house. Wow Christine has lost a ton of weight.